The few paragraphs that follow are taken from my recent article for the TERI (The Energy and Resources Institute) magazine, Terragreen. Published in the 2016 May issue, the article links what we often call traditional knowledge with the ways in which we understand ecology and the ways in which we are defining ‘sustainable development’. Sustainable development has today become a commonly used term, yet it describes a concept that is still being considered by different kinds of societies, by each in a manner of its choosing. This has happened because while historically how societies grew to be ‘developed’ was a process that took a variety of pathways, today the prescribed pathway to the ‘modern’ scarcely changes from one country to another. Hence culturally what these societies have considered as being ‘sustainable’ behaviour – each according to its ecological context – is being replaced by a prescribed template in which interpretations are discouraged. Such a regime of prescription has led only to the obscuring of the many different kinds of needs felt by communities that desire a ‘development’ that makes cultural sense, but also of the kinds of knowledge which will allow that ‘development’ to be sustainable. Some of this knowledge we can readily see. To employ labels whose origin is western, these streams of knowledge and practice are called traditional knowledge, intangible cultural heritage, indigenous wisdom, folk traditions, or indigenous and local knowledge. These labels help serve as gateways to understand both the ideas, ‘development’ and ‘sustainable’. It is well that they do for today, very much more conspicuously than 20 years earlier, there is a concern for declining biodiversity, about the pace and direction of global environmental change, a concern over the unsustainable human impact on the biosphere and the diminishing of community identity. There is widespread acknowledgement of the urgency of the situation – this is perceived across cultures, geographical scales (that is, from local units such as a village, to national governments), and knowledge systems (and this includes both formal and non-formal ways of recognising these systems). The need for such a new dialogue on the situation is expressed in several global science-policy initiatives, both older and recent, such as the Convention for Biological Diversity (CBD) which is now 22 years old, and the Intergovernmental Platform on Biodiversity and Ecosystem Services (IPBES), whose first authoritative reports became available in 2015. Development whose sustainability is defined locally and implemented locally means that the ‘investment’, ‘technology’ and ‘innovation’ (terms that have become popular to describe development efforts) comes from the people themselves. Many diverse agencies at this level – civil society, youth groups, vocational networks, small philanthropies – assist such development and provide the capacities needed. This is the level at which the greatest reliance on cultural approaches takes place, endogenously. In domains such as traditional medicine, forestry, the conservation of biodiversity, the protection of wetlands, it is practitioners of intangible cultural heritage and bearers of traditional knowledge, together with the communities to which they belong, who observe and interpret phenomena at scales much finer than formal scientists are familiar with. Besides, they possess the ability to draw upon considerable temporal depth in their observations. For the scientific world, such observations are invaluable contributions that advance our knowledge about climate change. For the local world, indigenous knowledge and cultural practices are the means with which the effects of climate change are negotiated so that livelihoods are maintained, ritual and cultivation continue, and survival remains meaningful. We lack not at all for experience with drought, yet have not grown used to treating water with the greatest of care. Drought does not strike in the manner a hailstorm does, yet our administrations seem unable to read the signals. Citizens and panchayats alike can contribute to our managing droughts better, provided all are willing to change both perception and behaviour. It is because drought is such a forbidding condition for any state to fall into that it becomes at once threatening and emotive. Its every symptom becomes a new trial for a drought-afflicted population and simultaneously a likely indictment of the administration, whether local or regional. Food and crop, water and health, wages and relief: this is the short list for which action is demanded by a population concerned for those in the drought-affected districts and blocks. The administration is bound to answer, as it is likewise bound to plan, prepare, anticipate and act. But where the interrogation of a government for its tardiness in providing immediate relief comes quickly, a consideration of the many factors that contribute to the set of conditions we call drought is done rarely, and scarcely at all when there is no drought. It is the gap between these two activities that has characterised most public criticism of the role of administration today when there is drought. For farmers and district or block-level administrators alike, drought is a normal and recurrent feature of climate in the dryland regions of India. It occurs in nearly all climatic zones – our long recording history of droughts and floods in particular show that whereas in eastern India (West Bengal, Odisha and Bihar) a drought occurs once in every five years, in Gujarat, East Rajasthan and western Uttar Pradesh the frequency is once in three years. Although the characteristics of what we call drought varies significantly from one meteorological sub-division to another, and indeed from one agro-ecological zone to another, the drought condition arises from a deficiency in precipitation that persists long enough to produce a serious hydrological imbalance. Drought is a complex phenomenon. There is first a need to distinguish between meteorological and agricultural droughts. A meteorological drought is a period of prolonged dry weather conditions due to below normal rainfall. An agricultural drought refers to the impact caused by precipitation shortages, temperature anomalies that lead to increased evapotranspiration by crops and vegetation, and consequently to a shortage of the water content in the soil, all being factors that adversely affect crop production and soil moisture. The National Commission on Agriculture has defined an agricultural drought differently for the kharif (monsoon cropping season, July to October) and rabi (winter cropping season, October to March). What the country has witnessed during March and April is an agricultural drought, brought about by the high temperatures which raised mean and maximum temperatures into the heat-wave band. This we have witnessed in Odisha, Telengana, Vidarbha, Marathwada, north interior Karnataka, Rayalaseema, coastal Andhra Pradesh, Tamil Nadu, eastern Madhya Pradesh and Chhattisgarh, Jharkhand and West Bengal. The uses to which we have put available climatic observations no longer suit an India which is learning to identify the impacts of climate change. Until 2002, the monsoon season was June to September, there was an assessment in May of how well (or not) the monsoon could turn out, and short-term forecasts of one to three days were available only for the major metros and occasionally a state that was in the path of a cyclone. But 2002 saw the first of the four El Niño spells that have occurred since 2000, and the effects on our Indian summer monsoon began to be felt and understood. The India Meteorology Department (which has become an everyday abbreviation of IMD for farmers and traders alike) has added computational and analytical resources furiously over the last decade. The new research and observational depth is complemented by the efforts of a Ministry of Earth Sciences which has channelled the copious output from our weather satellites, under the Indian Space Research Organisation (ISRO), and which is interpreted by the National Remote Sensing Centre (NRSC), to serve meteorological needs. The IMD, with 559 surface observatories, 100 Insat satellite-based data collection platforms, an ‘integrated agro-advisory service of India’ which has provided district-level forecasts since 2008, a High Performance Computing System commissioned in 2010 (whose servers run at Pune, Kolkata, Chennai, Mumbai, Guwahati, Nagpur, Ahmedabad, Bengaluru, Chandigarh, Bhubaneswar, Hyderabad and New Delhi) ploughs through an astonishing amount of numerical data every hour. Over the last four years, more ‘products’ (as the IMD system calls them) based on this data and its interpretation have been released via the internet into the public domain. These are reliable, timely (some observation series have three-hour intervals), and valuable for citizen and administrator alike. The new 11-grade indicator for assessing weekly rainfall departures in districts. Same data, but dramatically more useful guidance. Even so, the IMD’s framing of how its most popular measures are categorised is no longer capable of describing what rain – or the absence of rain – affects our districts. These popular measures are distributed every day, weekly and monthly in the form of ‘departures from normal’ tables, charts and maps. The rain adequacy categories are meant to guide alerts and advisories. 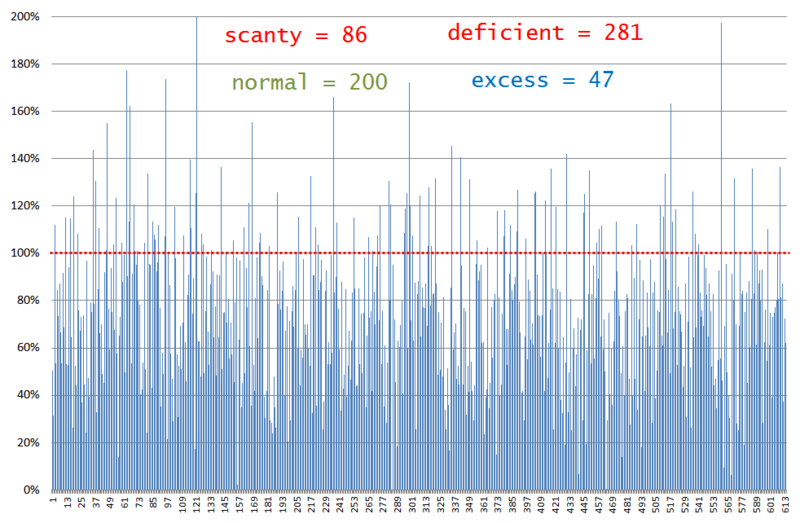 There are four: ‘normal’ is rainfall up to +19% above a given period’s average and also down to -19% from that same average, ‘excess’ is +20% rain and more, ‘deficient’ is -20% to -59% and ‘scanty’ is -60% to -99%. These categories can mislead a great deal more than they inform, for the difference between an excess of +21% and an excess of +41% can be the difference between water enough to puddle rice fields and a river breaking its banks to ruin those fields. In today’s concerns that have to do with the impacts of climate change, with the increasing variability of the monsoon season, and especially with the production of food crops, the IMD’s stock measurement ‘product’ is no longer viable. It ought to have been replaced at least a decade ago, for the IMD’s Hydromet Division maintains weekly data by meteorological sub-division and by district. This series of running records compares any given monsoon week’s rainfall, in a district, with the long period average (a 50-year period). Such fineness of detail must be matched by a measuring range-finder with appropriate interpretive indicators. That is why the ‘no rain’, ‘scanty’, ‘deficient’, ‘normal’ or ‘excess’ group of legacy measures must now be discarded. 1. 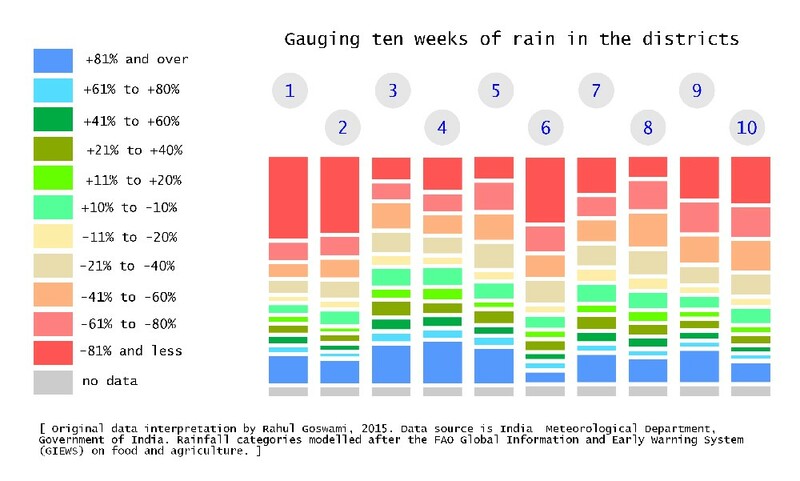 That districts which have experienced weeks of ‘-81% and less’ and ‘-61% to -80%’ rain – that is, very much less rain than they should have had – form the largest set of segments in the indicator bars. 2. 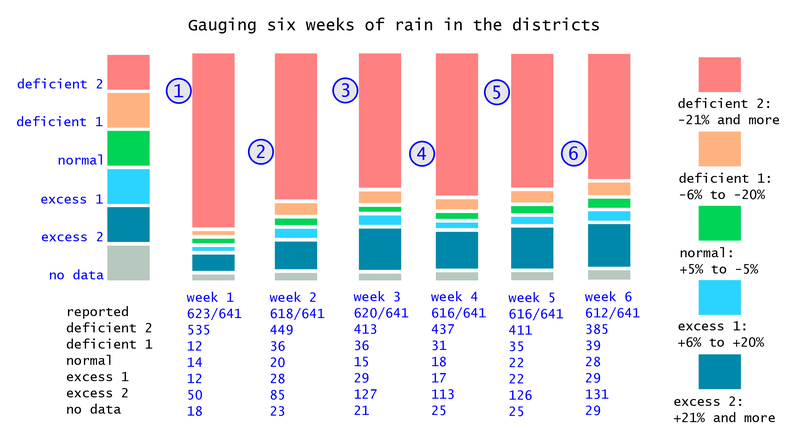 That districts which have experienced weeks of ‘+81% and over’ rain – that is, very much more rain than they should have had – form the next largest set of segments in the indicator bars. 3. That the indicator bars for ‘+10% to -10%’, ‘-11% to -20%’ and ‘+11% to +20%’ are, even together, considerably smaller than the segments that show degrees of excess rain and degrees of deficient rain. Far too many districts registering rainfall departures in the categories that collect extremes of readings. This is the detailed reading required to alert state administrations to drought, drought-like and potential flood conditions. Each bar corresponds to a week of district rainfall readings, and that week of readings is split into eleven grades. In this way, the tendency for administrations, citizens, the media and all those who must manage natural resources (particularly our farmers), to think in terms of an overall ‘deficit’ or an overall ‘surplus’ is nullified. Demands for water are not cumulative – they are made several times a day, and become more or less intense according to a cropping calendar, which in turn is influenced by the characteristics of a river basin and of an agro-ecological zone. 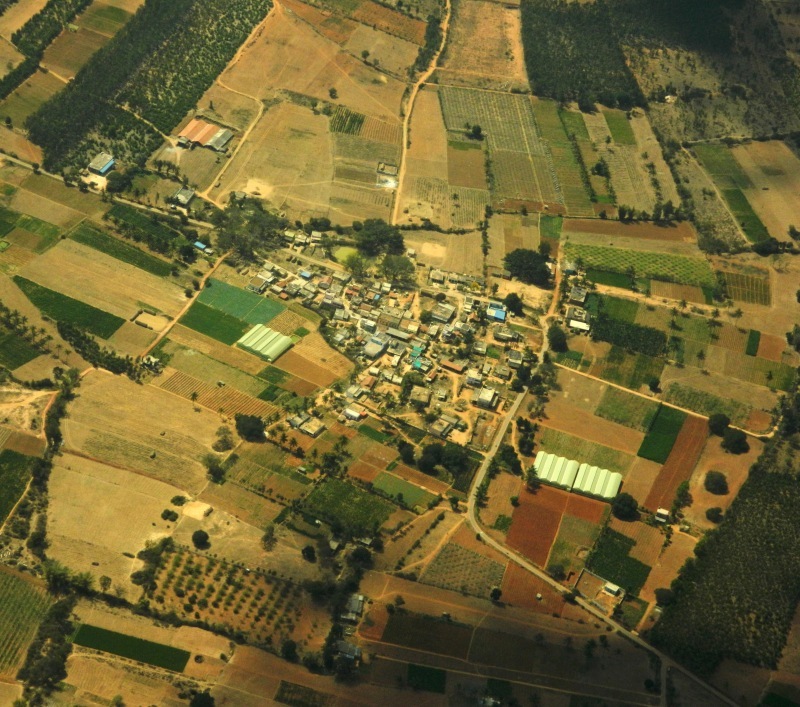 The advantages of the modified approach (which adapts the Food and Agriculture Organisation’s ‘Global Information and Early Warning System’ categorisation, designed to alert country food and agriculture administrators to impending food insecurity conditions) can be seen by comparing the single-most significant finding of the IMD’s normal method, with the finding of the new method, for the same point during the monsoon season. By 12 August 2015 the Hydromet Division’s weekly report card found that 15% of the districts had recorded cumulative rainfall of ‘normal’ and 16% has recorded cumulative rainfall of ‘deficient’. There are similar tallies concerning rainfall distribution – by region and temporally – for the meteorological sub-divisions and for states. In contrast the new eleven-grade measure showed that in seven out of 10 weeks, the ‘+81% and over’ category was the most frequent or next-most frequent, and that likewise, the ‘-81% and less’ category was also the most frequent or next-most frequent in seven out of 10 weeks. This finding alone demonstrates the ability of the new methodology to provide early warnings of climatic trauma in districts, which state administrations can respond to in a targeted manner. This year’s ritual of talking about climate and talking about the effects of changing climates has begun. This is the 21st year that this is being done, and in none of the previous 20 years have the talkers achieved any worthwhile goal. They will not this year either, although much money will be spent on slick and colourful messages to convince the publics of 196 countries otherwise. On 1 June the Bonn Climate Change Conference June 2015 began. The actors at this conference are mainly from the same cast that has played these roles for 20 years. They have been replaced here and there, and overall the main cast and supporting casts have grown in number – I think this growth in the number of climate negotiators and climate experts matches the growth rate of parts per million of carbon dioxide in our atmosphere, there may be a correlation that can inspire a new discipline of research. These conferences are expensive, for thousands of people are involved. 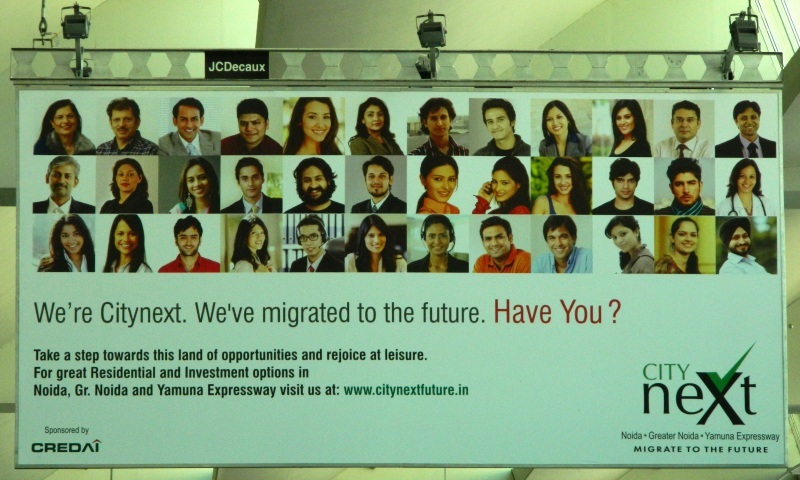 Most of these people profess to be concerned about climate change and its effects and most of these people maintain curriculum vitaes that are tomes designed to awe and impress, usually with the purpose of securing well-paid consultancies or academic tenureships or some such similar lucrative sinecures. It is an industry, this negotiating climate change, whose own rates of growth are about as steep as the number of those, in the OECD countries, who fall into debt. As before, there may be interesting correlations to note. The soundbite, big data and cool vector graphics world of UNFCCC climate negotiation pretense has gone on for far too long. The publics of the 196 countries that are constrained to send emissaries and observers and negotiators to these colossal jamborees have been lied to for 20 years quite successfully, and this 21st year we will see the lies repeated and presented all wrapped up in new tinsel. Many of these countries – from south-eastern and central Europe, from small island states in the Pacific and Indian oceans, from the Caribbean, from South America and from South-East Asia – pay for the useless privilege of sending representatives to attend this annual round of sophisticated tomfoolery. It is money down the drain for them. The United Nations Framework Convention on Climate Change (UNFCCC) under whose aegis most of these jamborees are held, and in whose august name most of the hollow but portentous pronouncements are ritually made, is an organisation that is over the hill, round the bend and up the wall. It represents today nothing that is in the interest of the public and it represents today almost everything that is in the interest of the corporate plutocracy, whether global or regional or national. 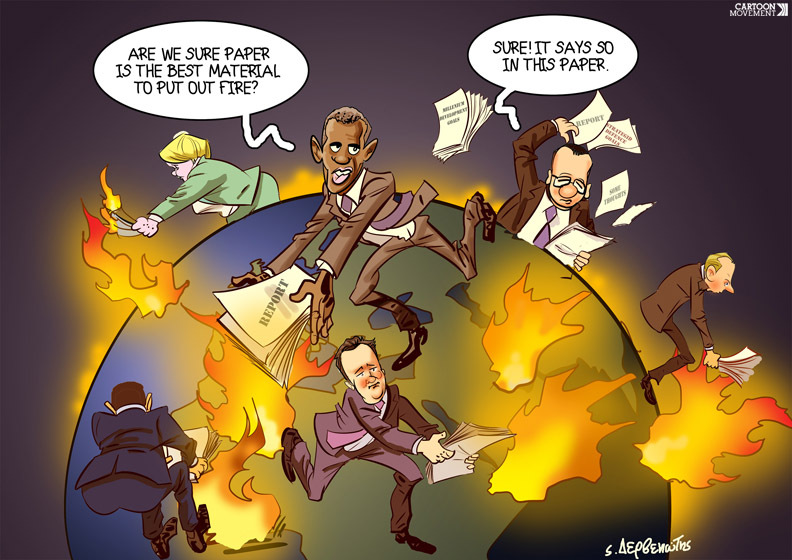 A 21st edition of annual obfuscation by the UNFCCC and its crony institutions. Unembarrassed by its own hopelessly prodigal existence, the UNFCCC lines up ‘technical expert meetings’ month after month to produce suitably technical papers that would fill libraries, if they were printed. It arranges conclaves in expensive locales (all sponsored naturally) to gauge ‘mitigation ambition of countries through multilateral assessment’. It commissions extensive reviews of the adequacy of countries’ agreed goals to keep the global average temperature from rising beyond 2°C above pre-industrial levels and the abundantly-qualified authors of these reviews (which read very much like the reviews of 2014, 2013, 2012 and so on) self-importantly inform us that “the world is not yet on track to achieve the long-term global goal, but successful mitigation policies are known and must be scaled up urgently”, just as their predecessors did 20 years ago. The main UNFCCC cast and its supporting cast (of thousands, but these thousands alas do not form the geographic representation that the United Nations system pretends to) spend days together at preparatory conferences and meetings, and pre-preparatory conferences and meetings, and agenda-setting conferences and meetings, and theme-outlining conferences and meetings, all year round. From somewhere within this flurry of busy nothingness they announce (perhaps on the days before the solstices and following the equinoxes) that new breakthroughs have been made in the negotiating text and that consensus is nigh. Whether the monsoon starts off on time, whether the June, July, August and September rainfall averages are met, and whether the seasonal pattern of the monsoon is maintained are expectations that must now be set aside. According to the Climate Prediction Center’s ENSO probability forecast, there is a 90% chance that El Niño conditions will prevail through June to August of the northern hemisphere and a more than 80% percent chance El Niño will last throughout all of 2015. What this means, especially when record warm global atmospheric temperatures (because we in South Asia and our neighbours in East Asia have continued burned coal as if the resulting CO2 and soot simply doesn’t exist) are being set, is the remaining months of 2015 – the monsoon period included – will bring strange, dangerous and extreme weather. We have already seen that over the last week, with the death toll from the heat wave having crossed 550. El Niño’s home is in the tropical eastern Pacific, but we in India need to watch the waters to our south very closely. New research published in the journal Nature Geoscience has examined records going back to 1950 and noticed that Indian Ocean absorbed heat at a low level until 2003. Thereafter, the excess oceanic heat in the Pacific Ocean found its way through the Indonesian archipelago and into the Indian Ocean. This is the gigantic reservoir of watery heat that is going to dictate terms to our summer monsoon, or what our school textbooks call the south-west monsoon. It is a worry for the entire South Asian region – India, Pakistan, Sri Lanka, Bangladesh, Nepal, the Maldives, Burma, Afghanistan and Bhutan. That is why when the Forum on Regional Climate Monitoring-Assessment-Prediction for Asia (FOCRA) issued its seasonal outlook for June to August 2015 it predicted weaker than normal Indian summer and East Asian monsoons. Precipitation over land is influenced by external factors such as the El Niño Southern Oscillation (the ENSO), the ‘Indian Ocean Dipole’, the ‘Arctic Oscillation’, and so on. There may be a “timely onset” of the monsoon, as the venerable IMD is used to saying, but that doesn’t mean our troubles are over. Far from it. 1. The Bharatiya Janata Party-led National Democratic Alliance government must stop treating the factors that contribute to climate change as commodities that can be bartered or traded. This has been the attitude of this government since it was formed in May 2014 – an attitude that says, in sum, ‘we will pursue whatever GDP goals we like and never mind the climate cost’, and that if such a pursuit is not to the liking of the Western industrialised world, India must be compensated. 2. Rising GDP is not the measure of a country and it is not the measure of India and Bharat. The consequences of pursuing rising GDP (which does not mean better overall incomes or better standards of living) have been plain to see for the better part of 25 years since the process of liberalisation began. Some of these consequences are visible in the form of a degraded natural environment, cities choked in pollution, the rapid rise of non-communicable diseases, the economic displacement of large rural populations. All these consequences have dimensions that deepen the impacts of climate change within our country. 3. There are no ‘terms of trade’ concerning climate change and its factors. There is no deal to jockey for in climate negotiations between a narrow and outdated idea of GDP-centred ‘development’ and monetary compensation. 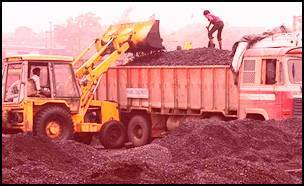 The government of India is not a broking agency to bet a carbon-intensive future for India against the willingness of Western countries to pay in order to halt such a future. This is not a carbon casino and the NDA-BJP government must immediately stop behaving as if it is. The environment minister, Prakash Javadekar, has twice in March 2015 said exactly this: we will go ahead and pollute all we like in the pursuit of our GDP dream – but if you (world) prefer us not to, give us lots of money as compensation. Such an attitude and such statements are to be condemned. That Javadekar has made such a statement is bad enough, but I find it deeply worrying that a statement like this may reflect a view within the NDA-BJP government that all levers of governance are in fact monetary ones that can be bet, like commodities can, against political positions at home and abroad. If so, this is a very serious error being made by the central government and its advisers. Javadekar has most recently made this stand clear in an interview with a foreign news agency. In this interview (which was published on 26 March 2015), Javadekar is reported to have said: “The world has to decide what they want. Every climate action has a cost.” Worse still, Javadekar said India’s government is considering the presentation of a deal – one set of commitments based on internal funding to control emissions, and a second set, with deeper emissions cuts, funded by foreign money. Such statements are by themselves alarming. If they also represent a more widespread view within the Indian government that the consequences of the country following a ‘development’ path can be parleyed into large sums of money, then it indicates a much more serious problem. The UNFCCC-led climate change negotiations are infirm, riddled with contradictions, a hotbed of international politics and are manipulated by finance and technology lobbies. It remains on paper an inter-governmental arrangement and it is one that India is a part of and party to. Under such circumstances, our country must do all it can to uphold moral action and thinking that is grounded in social and environmental justice. The so-called Annex 1 countries have all failed to do so, and instead have used the UNFCCC and all its associated mechanisms as tools to further industry and foreign policy interests. It is not in India’s nature and it is not in India’s character to to the same, but Javadekar’s statement and the government of India’s approach – now made visible by this statement – threatens to place it in the same group of countries. This is a crass misrepresentation of India. According to the available data, India in 2013 emitted 2,407 million tons of CO2 (the third largest emitter behind the USA and China). In our South Asian region, this is 8.9 times the combined emissions of our eight neighbours (Pakistan, 165; Bangladesh, 65; Sri Lanka, 15; Myanmar, 10; Afghanistan, 9.4; Nepal, 4.3; Maldives, 1.3; Bhutan, 0.7). When we speak internationally of being responsible we must first be responsible at home and to our neighbours. Javadekar’s is an irresponsible statement, and is grossly so. Future emissions are not and must never be treated as or suggested as being a futures commodity that can attract a money premium. Nor is it a bargaining chip in a carbon casino world. The government of India must clearly and plainly retract these statements immediately. We are being misinformed and poorly entertained. There is a great big complex apparatus that tells us, as it has done for most of the last 20 years, that climate change is about science and observation, about technology and finance. This is the international apparatus. Then there is the national bedlam, comprising government, NGOs, think-tanks, research institutes and academia, industry and business, capital markets and finance. The national bedlam on climate change contains many views, some of which are directly related to the international apparatus. Our government, usually in the form of utterances by the Ministry of Environment, Forests and Climate Change, attempts to connect economics to everything else it thinks is important, and present the resulting mess as our climate change policy, which only provokes more bedlam. Such is the state of affairs in India concerning climate change. Industry and finance, whatever their motivations (profit, market, subsidies, friendly politicians, and so on), are fairly consistent in what they say they want. NGOs and think-tanks – most of which function as localised versions of the international apparatus – are responsible for an outsized share of the bedlam, for they must not only protect the interests of their principals (usually in the West) but at the same time be seen to be informed, authoritative and influential at home. Ordinarily, this renders them schizophrenic, but the hullabaloo surrounding climate change in India is so loud, no-one notices the schizophrenia of the NGOs and think-tanks. Media – that is to say, vapid but noisy television and dull but verbose print commentators – sides with one group or another depending on who’s paying for the junkets. The punctuations in this long-running and episodic climate change opera that we witness in India are the annual international gatherings, and the erratic policy pronouncements by the central government. For most people, struggling with food price inflation, with urban living environments choked by particulate matter, hounded by creditors and surrounded by useless gadgetry, climate change is a non-subject. 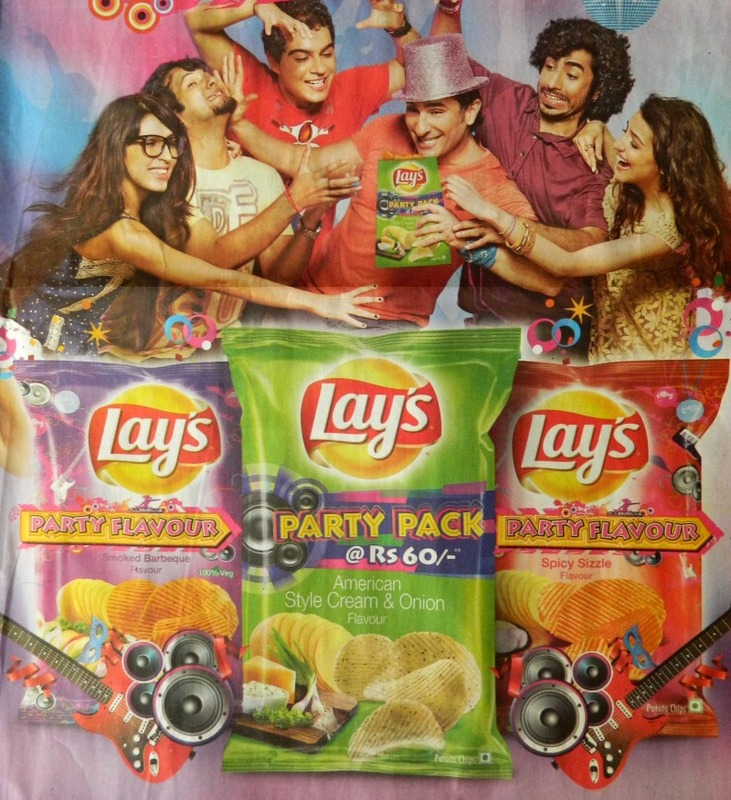 And so the middle class stays out of the bedlam, for it is too busy negotiating the storied ‘growth’ of India or breathlessly seeking to profit from it in as many ways as there are flavours of potato chips. Who is left from the 1.275 billion Bharat-vaasis who can cast an appraising eye on the bit players and techno-buskers, and who can judge for themselves the consequences of their actions? We don’t know. And it is such not knowing that balances, with a taut silence, the bedlam of the posturing think-tanks, the technology fetishists, the grasping NGOs, the carbon merchants and their political cronies. It has helped us not at all to be served, every other week or so, the bland intellectual regurgitations of India’s talking climate heads. It has helped us not at all to be preached at (faithfully reported, accompanied by appropriate editorial cant) by the United Nations whose agency, the UNFCCC, has fostered 20 years of expensive gatherings designed to deceive thinking folk. It has helped us not at all to have to correct, time and again, a government that does nothing about capitalism’s operatives who consistently attack and dismantle efforts to protect our people from environmentally destructive activities. It has helped us not at all to have dealt out to us, from one ruling coalition to the next, from a fattened ’empowered group of ministers’ to a PM’s Council that prefers fiat, missions and programmes that speak ‘renewable’ but which refuse stubbornly to talk consumption. Climate change and Bharat is about none of this and it is about all of this in relation to our behaviour. Ours is the land of air-conditioned youth devouring cup noodles while gesturing with greasy fingers across smartphone screens. It is not the land where their grand-parents tilled fields, tended orchards, walked on pilgrimages and lit lanterns in simple dwellings. But this is now, and here, in urban Coimbatore and Cuttack as much as in rural Darbhanga and Dharwad, the reckoning of the effect of our 1.275 on climate has to do with the buying of cars (bigger and two per family) and the widening of roads. It has to do with the building of housing ‘complexes’ (modern amenities and 24×7 power, but naturally), the contrived convenience factor of retail food markets whose demands deepen the monoculturing of our land mosaics, once so very diverse with coarse cereals, the myth-making of jobs and employment by cramming vast buildings with directionless migrant youth, and attaching to them (costs calculated by the second) the electronic machinery that makes online retail possible, the imagery of the flick of the switch or click of a button delivering goods and services as though from the horn of plenty, the vacuous promises of imminent superpowerdom and a techno-utopia set to the beat of Bollywood lyrics. We have indeed been misinformed. The Asian Development Bank has, amongst the world’s multilateral development banks, been a bit of a latecomer to the area of climate financing with the help of modelling. Its senior peers – the World Bank and the European Bank for Reconstruction and Development – have been at it for a while, with the World Bank being rather in its own league if one was to judge by the tonnage of reports it has printed. The ADB probably holds its own on the matter against the Inter-American Development Bank and the African Development Bank, but this latest effort, I think, pushes it ahead of the last two. Not for any reason that would gladden a farmer or a municipal worker, for that is not the audience intended for ‘Assessing the costs of climate change and adaptation in South Asia’ (Asian Development Bank, 2014), which was released to the Asian world a few days ago. But the volume should immensely help the modelling crews from a dozen and more international agencies that specialise in this arcane craft. Providing the scientific basis around which a multilateral lending bank can plan its climate financing strategies will help the craft find a future. Rather less sunny is the outlook for states and districts, cities and panchayats, who may find an over-zealous administrator or two quoting blithely from such a report while in search of elusive ‘mitigation’. Many reassuringly complex diagrams must only mean we need bigger loans? In my view, this volume is useless. It is so because it is based on a variety of modelling computations which have their origin in the methods used for the IPCC’s Fourth Assessment Report (that was released in 2007). The permanent problem with all such ‘earth science’ modelling approaches is that it uses global data sets which must be ‘downscaled’ to local regions. No matter how sophisticated they are claimed to be by their inventors and sponsors, such models can only work with regular and large sets of well-scrubbed data that have been collected the same way over a long period of time and recorded reliably. This may serve a ‘global’ model (which is irrelevant to us in the districts) but in almost every single case of ‘downscaling’, a scaling down may make a smattering of sense if there is some comparable data relating to the region for which the scaling is taking place. And this correlation, I can assure you, is not possible 99 times out of 100. But that doesn’t bother the ADB, because it is a bank, it must find a way for Asian countries to agree to taking loans that help them mitigate the effects of rampaging climate change, as this report tries to convince us about from 2030 to 2050 and 2080 (by which time those who have cashed in their climate technology transfer stock options will have passed on). Which is why the ADB has said its unimpeachable analysis is based on “a three-step modeling approach” and this is “(i) regional climate modeling (ii) physical impact assessment, and (iii) economic assessment”, the last aspect being what they’re betting the thermometer on. Each blue bar represents the actual rainfall recorded by a district as a percentage of its normal. There are 614 district recordings in this chart.. The red dotted line is the 100% mark, and many of the bars end below, or way below, this mark. This is the district-level view of cumulative rainfall over eight rain weeks using the IMD’s own data. Over eight weeks of recorded monsoon rain, the district-level data available with the India Meteorological Department (IMD) portrays a picture that is very different from its ‘national’ and ‘regional’ advice about the strength and consistency of rainfall. In its first weekly briefing on the monsoon of August 2014, IMD said: “For the country as a whole, cumulative rainfall during this year’s monsoon (01 June to 30 July 2014) has so far upto 30 July been 23% below the Long Period Average.” Out of 36 meteorological sub-divisions, said the IMD, the rainfall has been normal over 15 and deficient over 21 sub-divisions. The four regional readings that make IMD’s data look less worrisome than it actually is. 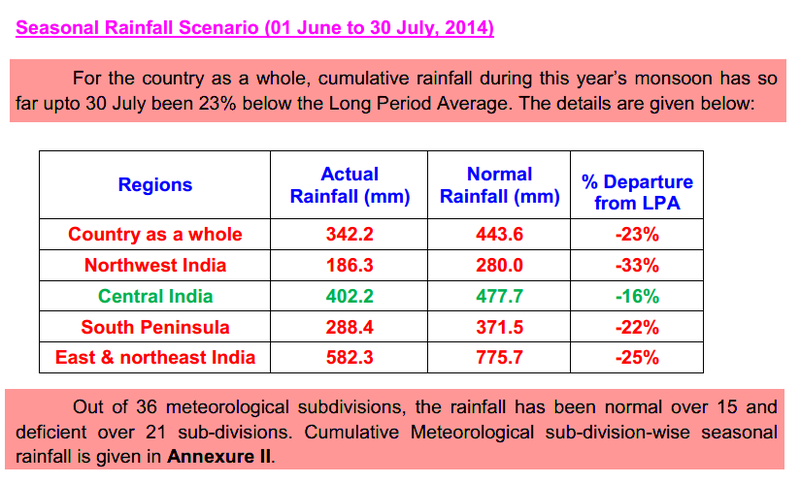 However, here is a far more realistic reading of the monsoon season so far, from the IMD’s own data. For the 614 individual readings from districts that have regular rainfall readings, we have the following: 86 districts have registered scanty rainfall (-99% to -60%); 281 districts have registered deficient rainfall (-59% to -20%); 200 districts have registered normal rainfall (-19% to +19%); and 47 districts have registered excess rainfall (+20% and more). What this means, and the chart I have provided to illustrate the 614 individual values leaves us in no doubt, is that 367 out of 614 districts have had meagre rain for eight weeks. This also means that over eight weeks where there should have been rainfall that – as the IMD predicted in early June – would be around 95% of the ‘long period average’, instead three out of five districts have had less than 80% of their usual quota. Monsoon measures for six weeks. A few more districts reporting the revised normal, but the deficient-2 category still has too many districts, and so does excess-2. And why so many ‘no data’ (many from the north-east)? When a politician and a bureaucrat get together to supply punditry on the monsoon, the outcome is directionless confusion. There is no reason for our shared knowledge on monsoon 2014 to be reduced to a few boilerplate paragraphs and a couple of amateurish maps and charts, not with the equipment and scientific personnel the Republic of India has invested in so that we read the rain better. But Jitendra Singh, the Minister of State who is in charge of Science, Technology and Earth Sciences, and Laxman Singh Rathore, the Director General of the India Meteorological Department, have not progressed beyond the era of cyclostyled obfuscation. Coming from senior administrators, such fuzzy distraction cannot be tolerated. The Ministry of Earth Sciences, the India Meteorology Department and the Ministry of Information and Broadcasting must cease (desist, stop, halt – do it now) the use of a ‘national’ rainfall average to describe the progress of monsoon 2014. This is a measure that has no meaning whatsoever for cultivators in any of our agro-ecological zones, and has no meaning for any individual taluka or tehsil in the 36 meteorological sub-divisions. What we need to see urgently adopted is a realistic overview that numerically and graphically explains the situation, at as granular a level as possible. When that does not happen, news media and information sources struggle to make sense of monsoon and climate and their reporting becomes dangerously misleading – consider “Late monsoon starts Indian farmer’s ‘journey to hell’ “; “Why the monsoon numbers hide reality” (this report is an attempt to point out the problem); “Monsoon deficit has come down to 31 per cent, no need to be ‘alarmist’: Met office”; “Satisfactory rainfall may wash away monsoon deficit”. Using a revised categorisation of rainfall sufficiency levels (my method and the reasoning for it use is available here) we find that for the fifth and sixth weeks of monsoon, there has been a small improvement which does not lower the high likelihood of drought conditions becoming prevalent in districts and scarcity of water for our settlements – Messers Singh and Rathore please note (or visit the Indian Climate Portal Monsoon 2014 page which is an active repository of reportage, views, commentary and original data analysis on our monsoon). The fifth monsoon week is 03 to 09 July 2014 and the sixth monsoon week is 10 to 16 July 2014. There has been a small addition to the revised normal rainfall category (-5% to +5%), rising from 18 districts recording normal rainfall in the 4th week to 22 in the 5th and 28 in the 6th. There has also been an improvement in the number of districts recording deficit-2 levels of rainfall (-21% and more) with 437 in the 4th week, 411 in the 5th week and 385 in the 6th week. For the remainder of July the likelihood of more rainfall in the districts that have recorded normal or excess-1 (+6% to +20%) is small, according to the available forecasts, and this means that monsoon 2014 will begin August with far fewer districts registering normal rainfall than they should at this stage. The NOAA map of the land and sea percentiles. Note the warm water south of India and to the east of the Philippines. With many sowing cycles beginning belatedly between now and the end of July, the Ministry of Earth Sciences, the India Meteorology Department, the Ministry of Agriculture and the Ministry of Water Resources are advised to work together (why aren’t they doing so already – or at least mandating ICAR institutes to supply them with analysis which they must absorb jointly?) to understand the impacts of regional, tropical and global climate trends that affect the Indian summer monsoon. There is good reason to. 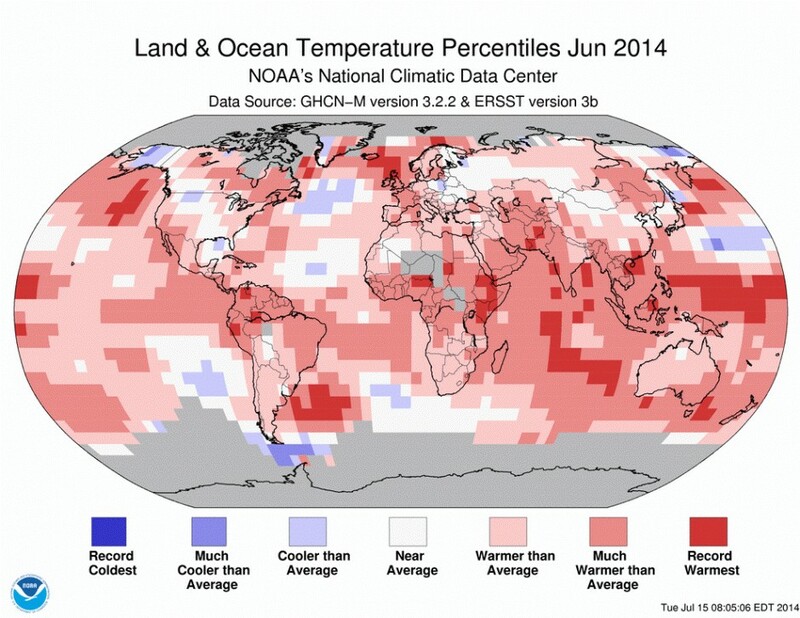 According to NOAA, for 2014 June land and ocean surface temperatures jumped 0.72 Celsius above the 20th century average. These new records were pushed upwards by a broad warming of the ocean surface, and not only by an Equatorial Pacific whose waters are approaching the warmth usually seen during an El Nino. NOAA has said there was “extreme warming of almost every major world ocean zone” which warmed local air masses and had a far-reaching impact on global climate, “likely delaying the Indian monsoon”.